Bald Eagle talon collected by Paul Schumacher on Santa Cruz Island in 1875. 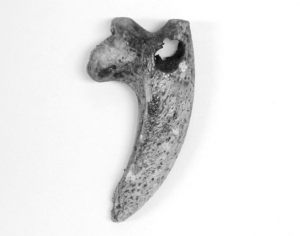 [NMNH A18192-0/004199] Talon has been pierced prehistorically for wearing as an ornament. 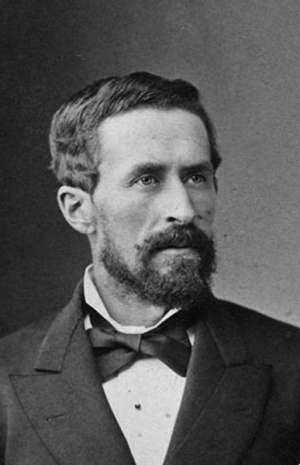 SCHUMACHER, Paul (1844-1883), born in Hungary and educated in Vienna, Austria, as a Civil Engineer, he emigrated to San Francisco where he was hired in 1871 by the U.S. Coast Survey. Schumacher was naturalized as a citizen on September 7, 1874 in San Francisco. While traveling the state of California for his work, Schumacher developed a keen interest in archaeology. Between 1872 and 1879 he collected artifacts that were sent to the Smithsonian Institution from six of the eight Channel Islands. Schumacher visited Santa Cruz Island in 1875, and spent three months amassing a collection of Chumash artifacts for the Smithsonian to be viewed at the 1876 Centennial Exposition in Philadelphia, PA held May 10-November 10, 1876. It was the first official World's Fair, held in Philadelphia, PA. Schumacher supplied the Smithsonian Institution with artifacts from the Chumash region for the Exhibition, as did William H. Dall and Stephen Bowers. Schumacher’s island excavations began only about 50 years after the last Island Chumash villages were abandoned, although Chumash people continued to visit the islands as employees of colonial fishing, otter hunting, or ranching operations. In 1877 he was the first recorded archaeologist to visit San Clemente Island, the most southerly of the California Channel Islands. In 1875, 1877 and 1878 he excavated a number of sites on Santa Catalina Island, where he also collected plants in June 1878. A raven skull he collected on Santa Catalina Island is in the U.S. National Museum of Natural History (#15662); a dog skull he collected on San Miguel Island is also in the Smithsonian. Schumacher is also the first known to have done archaeological work on San Nicolas Island (1877). Schumacher died at age 44 on May 22, 1883 in San Antonio, Mexico. » Schumacher, Paul 1874-1877 Letters to Spencer F. Baird, December 8, 1874 – February 26, 1877. Manuscript 7132, Smithsonian Institution National Anthropological Archives, Washington D.C.
» Schumacher, Paul Remarks on the Kjökken-möddings on the Northwest Coast of America in Annual Report of the Board of Regents of the Smithsonian Institution, Showing the Operations, Expenditures and Condition of the Institution for the Year 1873: pp. 354-362, 1874. Government Printing Office, Washington D.C.
» Schumacher, Paul Ancient Graves and Shell-heaps of California. Annual Report of the Board of Regents of the Smithsonian Institution showing the Operations, Expenditures, and Condition of the Institution for the Year 1874: pp. 335-350, 1875. Government Printing Office, Washington D.C.
» Schumacher, Paul The Manufacture of Shell Fishhooks by the Early Inhabitants of the Santa Barbara Channel Islands in Archiv. fur Anthropologie 8:223-224. Reprinted in 1960. Papers on California Archaeology: Reports of the University of California Archaeology Survey 50(83), 1875, Berkley. » Schumacher, Paul Researches in the Kjökkenmöddings and Graves of a Former Population of the Santa Barbara Islands and the Adjacent Mainland in United States Geological and Geographical Survey of the Territories Bulletin 3:37-56, 1877. » Schumacher, Paul Researches in the Kjökkenmöddings and Graves of a Former Population of the Coast of Oregon in United States Geological and Geographic Survey of the Territories Bulletin 3:27-35, 1877. » Schumacher, Paul Methods of Making Stone Weapons in United States Geographical and Geographical Survey Bulletin 3:547-549. Reprint of an article in Archiv für Anthropologie 7:364. » Schumacher, Paul Aboriginal Settlements of the Pacific Coast in Popular Science Monthly 10:353-356, 1877. » Schumacher, Paul The Method of Manufacture of Several Articles by the former Indians of Southern California in Eleventh Annual Report of the Peabody Museum of American Archaeology and Ethnology in Connection with Harvard University 2(2):258-268, 1878. Cambridge, MA. » Schumacher, Paul The Method of Manufacture of Soapstone Pots in Report Upon United States Geographical Surveys West of the One Hundredth Meridian 7:117-121, 1879. Washington D.C.
» Schumacher, Paul The Method of Manufacturing Pottery and Baskets among the Indians of Southern California in Twelfth Annual Report of the Peabody Museum of American Archaeology and Ethnology in Connection with Harvard University: pp. 521-525, 1880. Cambridge, MA.